Ethnomusicology: A Contemporary Reader is designed to supplement a textbook for an introductory course in ethnomusicology. It offers a cross section of the best new writing in the field from the last 15-20 years. Many instructors supplement textbook readings and listening assignments with scholarly articles that provide more in-depth information on geographic regions and topics and introduce issues that can facilitate class or small group discussion. These sources serve other purposes as well: they exemplify research technique and format and serve as models for the use of academic language, and collectively they can also illustrate the range of ethnographic method and analytical style in the discipline of ethnomusicology. Ethnomusicology: A Contemporary Reader serves as a basic introduction to the best writing in the field for students, professors, and music professionals. It is perfect for both introductory and upper level courses in world music. 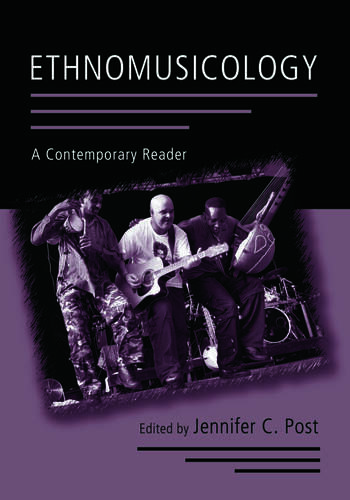 Jennifer C. Post is the author of Routledge's Ethnomusicology: A Guide to Research. She is Assistant Professor of Music at Middlebury College and Curator of the Helen Harkness Flanders Ballad Collection at Middlebury. She compiles the "Current Bibliography" and "Current Theses and Dissertations" lists published tri-yearly in the journal Ethnomusicology.